Modular construction is a special type of construction that consists of building/manufacturing a structure offsite and then moving it to the job site after the structure is nearly completed. Compared to stick-built construction, modular structures are built in a factory-like environment using standardized and integrated work processes that will deviate very little from project to project. With the structure pre-assembled in the factory, all that is left is delivery and installation on site. Modular construction can be used in nearly any project that stick built construction can be used; from the education to the military, all sectors public and private have a use for modular construction. 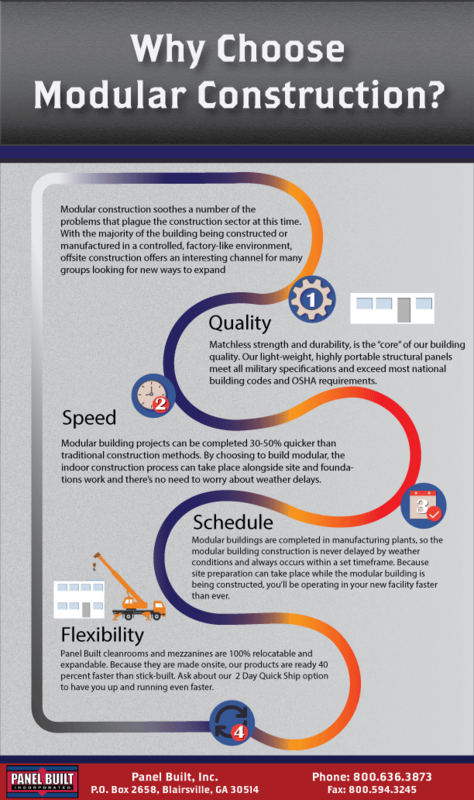 There are a number of benefits to choosing modular construction over stick built, here are some of our favorites! If you want more reasons as to Why Choose Modular Construction, give us a call at 800.636.3873 or send us your questions at info@panelbuilt.com! We will be more than happy to help with any questions, concerns, or quote requests that you may need.